Above is a comparison of the aroma and flavor characteristics of some common varietals. The closer one varietal is to another, the more they share common descriptors. Do note, that these are only aroma (bouquet too!) 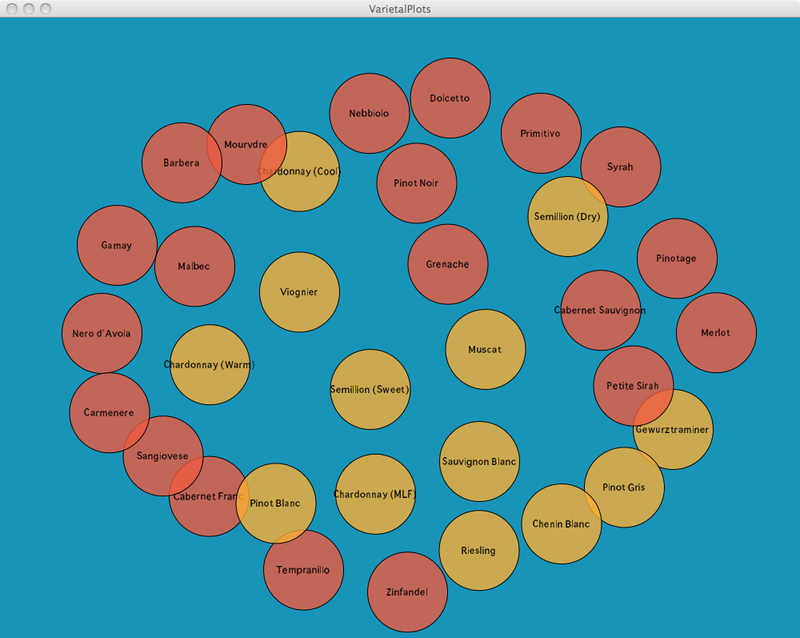 and flavor descriptors. Mouthfeel was not included at all. So really it’s a comparison of the aromatic compounds in each varietal. In order to analyze the data I had to have some sort of common identifier so there are two non-aroma or flavor characteristics that were used: Red/White and the species of grape (Vinifera). I took the common descriptors for each of the above varietals from Wine.com and placed them into a comparison matrix. My justification for using them as a source is that they have a massive database to pull from and therefore can be pretty accurate. However, they neglected Chardonnay and Pinot Noir for some reason. I based the common descriptors for those off of my own knowledge and comparing against numerous sources. Chardonnay was broken down in to those from warm climates, from cool climates and those with Malolactic Fermentation (MLF) since they really do have their own characteristics. The matrix with the varietals was then analyzed using SPSS to create a similarity matrix which calculates the “distance” between each varietal based on how many common characteristics they share. This matrix was then taken and analyzed with Multidimensional Scaling (PROXSCAL), again in SPSS, to come up with coordinate points based on their distances so I could plot them. I took these plots and created a visualization program using Processing to generate the image.